“A climb to remember” would be a more fitting title to this adventure on the Olympic mountain. As a hiker and snowshoer I have never ventured into the realm of downhill skiing, but more into the less-likely-to-crash category of cross-country skiing, which provides me with more controllable downhill stretches. 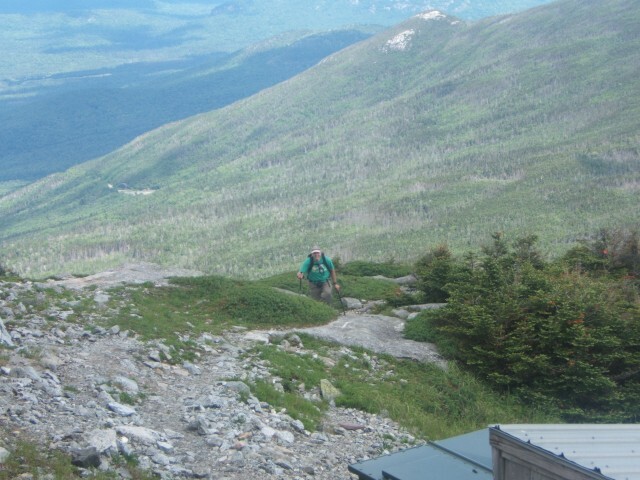 When it comes to the ski slides on Whiteface I see myself only visiting them on foot, so that’s exactly the plan I set for myself one cloudy June morning. This write-up is for all those who have driven by and looked up at the scars and perchance wished to visit the slide on foot and not by ski. In light of the popularity of the slides and the excitement of when they open during the ski season, here is a naked look at what you are gliding on. 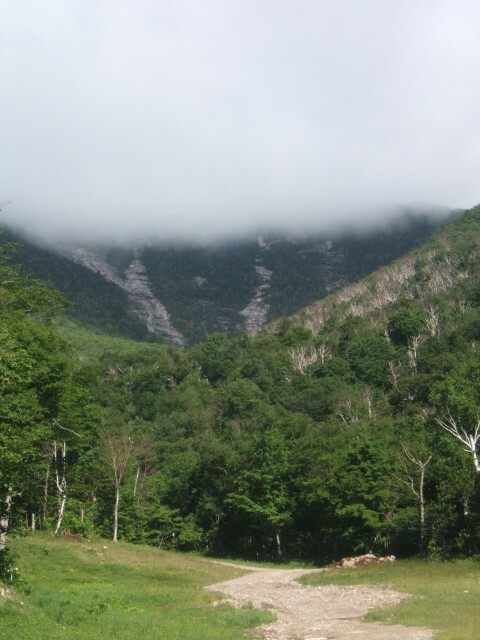 As I mentioned, the clouds were low — very low — and we had no doubt that we'd be climbing right into them. We decided to not descend the slide with the fear that it could be wet and a descent on a slide isn’t all that much fun, so we spotted a second car at the Atmospheric Science Research Center in Wilmington, right below the toll booth for the mountain. We then returned to the ski area to approach our climb. 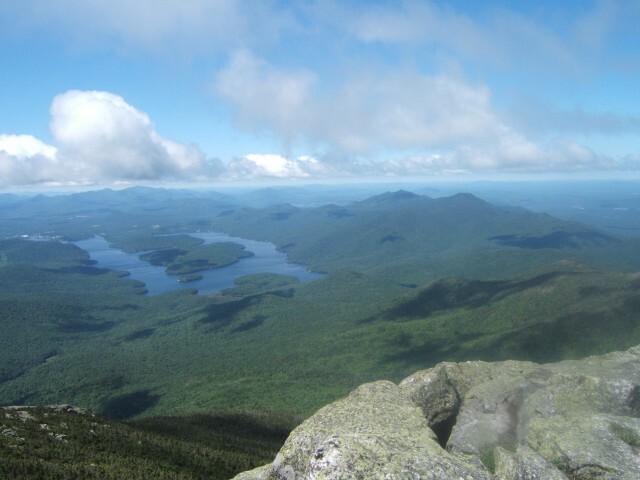 Of course it’s June and a weekend, but it’s just prior to when school is out and visitors from all over the world set their sights on Lake Placid. The gondola wasn’t running on this day, but that could have been due to the high winds and the cloud cover. It’s not all that unusual for it to get shut down when the conditions are poor. 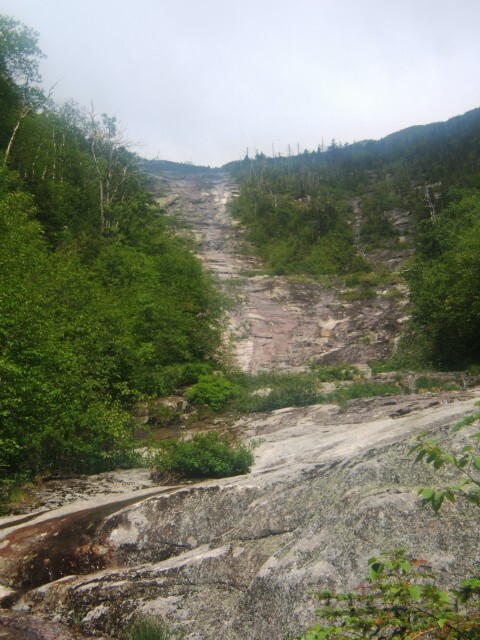 Our first thought was to hike the Stag Falls Trail, but we had been there so many times in the past we decided on a quicker approach and walked the ski trails as much as we could. We got a few odd stares of wonder as we passed by groups hanging around the lodge area, maybe waiting to see if the gondola was going to open soon. Others appeared to be planning a day on the slopes with their mountain bikes, and some were probably just sightseeing. The brown grass was swaying high on the slopes in a cool breeze fitting of a late spring air as we made our direct approach to the slides. The climb was steep and steady, but not to our surprise. It is, after all, a direct line up a mountain on a ski slope; switchbacks just don’t exist here. 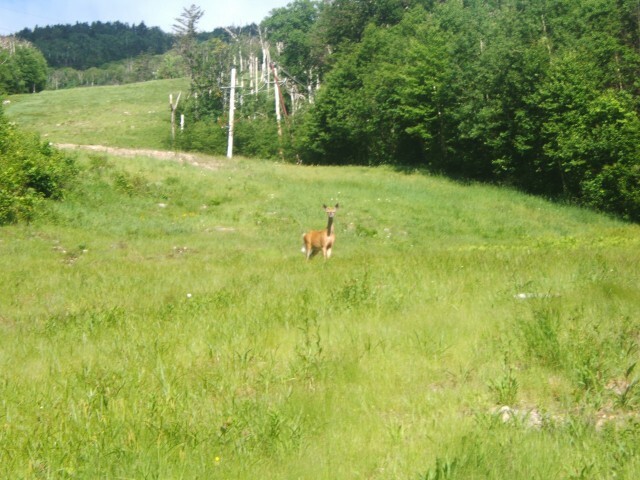 As we approached mid-station we had made a friend in a local deer, which oddly enough was not upset by our close passing. He also thought us odd, I’m sure. We continued to head as far to the right as we could, eventually grew weary of the ski slopes and just wanted to be in the brook approaching the slides. We knew that a ski trail would be at the base for those exiting them in the winter, but our impatience made us veer into the brook. As we descended steeply over the berm through the trees we started to second guess our choice but continued anyhow; persistence prevailed. The brook was littered with an abundance of boulders, some of which blocked the entire route and needed to be skirted by going back into the woods. At last we saw the slide in the distance and rallied to gain our attack point. And then, there it was — the exit trail to the ski slopes. We started the actual climb, which in the dominion of rock climbing is not very steep, but sections were steep enough to require the use of hands and our approach shoes. Regular hiking boots probably would have been fine, but you never really know. 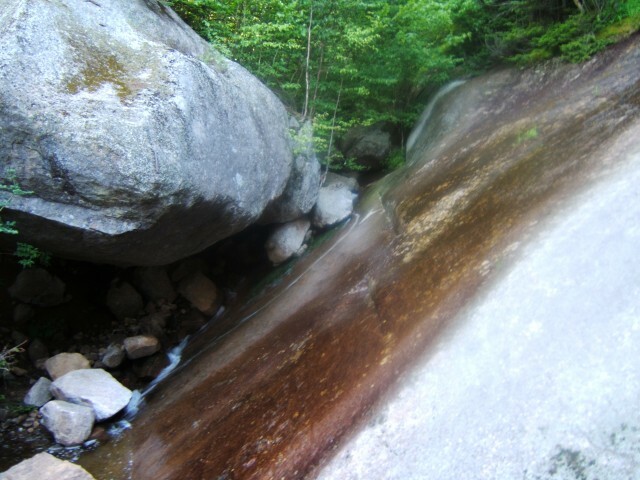 The last time I just used hiking boots it was on Giant Mountain's Eagle Slide, and they were not appropriate there. A steady stream of water was running past us down the open rock, which wasn’t all that surprising considering the saturation level of the ground and the rains a couple of days prior. 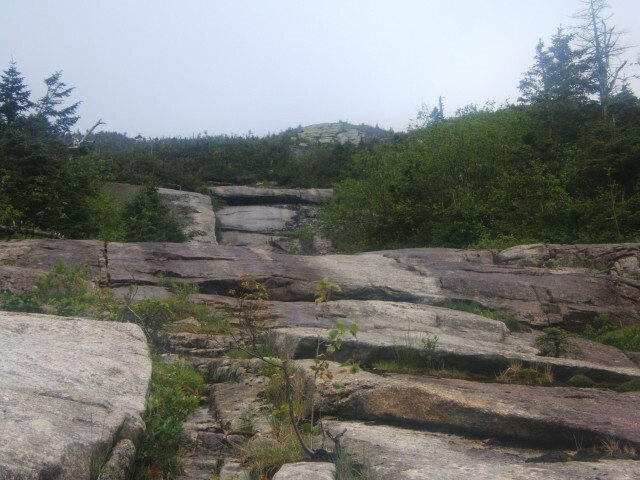 We continued to press on, avoiding the wet rock to keep our shoes dry and as grippy as possible. We meandered about the slide as needed to reduce the degree of slope we were on, and in some cases we had no choice. It wasn’t long until we came to a fork in the slide, where we needed to make a decision. It was hard to tell from this vantage point which we should use, and we didn’t really look too closely into it before we left the house. We chose right for no other reason than we needed to make a decision. It seemed like the thing to do at the time and ended up being not necessarily the wrong choice, but one that would pick our fate to the summit. This fork quickly became much less of a slide and resembled open slab rock interrupted by vegetation. A mixture of scrub brush kept separating sections of more rock sidewalk. This segment kept pushing us right, further from the summit and closer to the trail along the ridge. We didn’t really want to go there, but what can you do when the choice is made for you? I guess we could have pushed through the dense krummholz to inch closer to the summit, but our forest-beaten bodies wanted the easiest route. Eventually the terrain steepened to an almost vertical angle with impenetrable scrub. We pushed on with all our might, stepping through small holes in the growth, our pant legs getting tangled and torn in the weather-strengthened branches. We battled it by using unplanned switchbacks as best we could, and we aided one another to get up over tall steps and rock shelves as we slowly drew slowly closer to the trail. Suddenly the clouds parted and the buildings appeared high above us. Was it a sign, a gift from above congratulating us on our esteemed effort? Or, had it just taken us so long to move in a forward motion the weather had cleared? I think maybe a combination of both, but more of the latter I am sure. We finally managed to find a path of least resistance, but only after having to descend about a hundred feet to obtain it. Then we squeezed ourselves through a narrow opening between a boulder and a wall of rock located behind a thin seam in the trees. Atop the rocks was one of the most unique views of the slide, the ski center and the summit we had ever encountered. 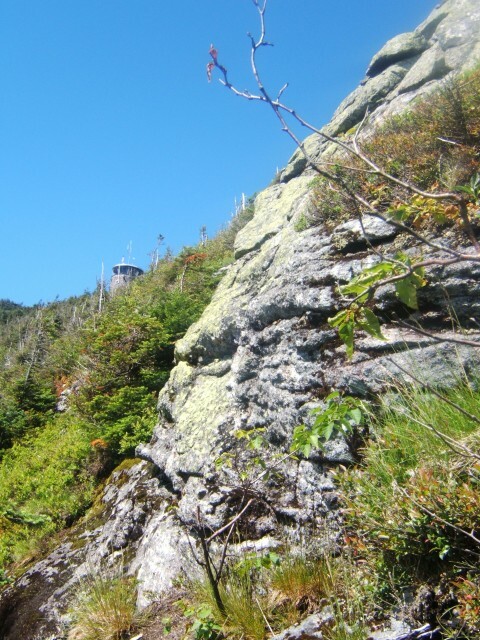 Then with huff and a holler we arose victorious, and a bit raw, onto the ridge trail. We popped out as if being delivered from time in front of a twenty-something couple on their hike down the mountain. With wonder and awe they rubbernecked around, jaw slightly above the ground as they asked, “Where did you come from?” We tried to explain our adventure to them, but I think they just thought us a bit strange in our pursuits. It wasn’t far to the summit, maybe 10 minutes. It could have been less but it seemed like an eternity. Atop the now open and sunny summit about a dozen visitors couldn’t believe we climbed to the summit. Some honestly didn’t think there was a trail and others just thought that the gumption it took to do such a thing was just, well, confusing — if they only knew the half of it! We would now hang out for a bit and then start our descent back down the ridge trail and follow the Wilmington Trail back to our car. Even with knees like Jello we placed one foot in front of another and descended the slopes with conversation of a climb well worth the added effort. It’s amazing how a tough experience in the wild, while at the time seems relentless and ridiculous, later becomes one of the most memorable times of your life. Some things just go unexplained and maybe it’s better off that way.